We produced an effective pop up exhibition design that attracted a high number of delegates in a wide range of exhibitions. 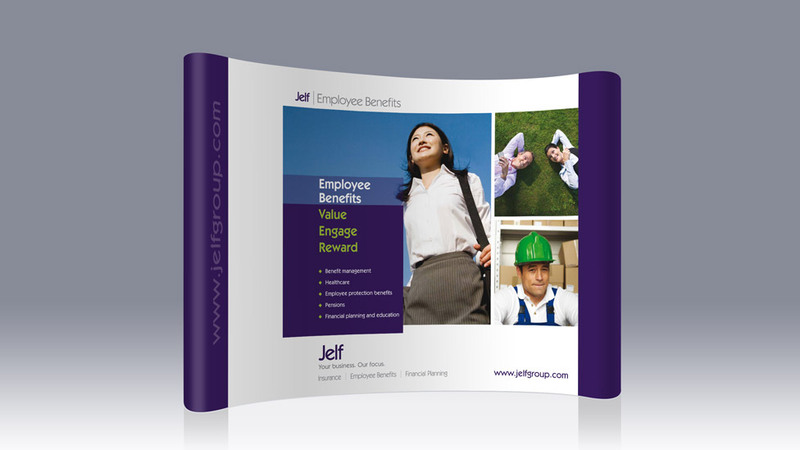 Business consultancy Jelf asked Parker Design to create a pop up exhibition design they could use at a variety of shows and display locations. The design needed to show the range of services offered by the business through their Employee Benefits division and capture the attention of delegates in a busy exhibition hall environment. We used a clean layout that echoed the company’s recognisable colour scheme of purple, combined with crisp white space and ultra-modern typefaces to create an imposing pop up exhibition design. As the business is customer and people-focused, we included bright and aspirational royalty-free stock photography that featured characterful individuals which people could easily identify with. Picking up on the colours within the images, our design team introduced a green highlight colour that helped give prominence to some of the messaging. Our client was very pleased with the result, with the stand attracting high numbers of delegates. Over the years we have helped clients in a wide range of sectors with distinctive and effective pop-up stand design ideas that have contributed to many success stories.